Has this been done to death already? Oh well, here it comes again! I love Nails Inc and have loads of their polishes that I've bought as sets from QVC. I've also got most of the freebie ones from the previous diet coke offer last year and from when they come free with Instyle / Glamour magazines. 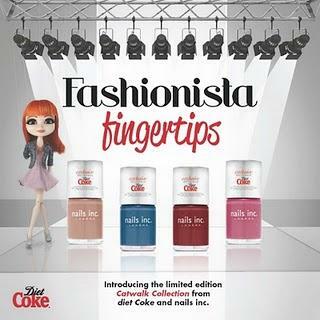 When I saw the new diet coke polishes, I thought the pink and the red shades (heather grey and plum) looked a bit boring and decided I only want the beige and blue (caramel and denim). I asked my Mum to pick them up for me as she works near a large Boots which I knew would have them. She accidentally got me Heather Grey instead of Denim, but it was a good mistake as it's a much more interesting colour in real life than it seemed in the promotional photos. Mum then went back for Denim for me the next day. I was out shopping this morning and thought I'd take a photo of the stand to accompany my blog post and guess what happened... plum looked more interesting in real life too, so I bought two more bottles of diet coke - my fridge is packed full of them! Sorry for the very rubbish camera work here - someone was looking at me like I was deranged so I rushed! So despite my original intentions, I've ended up with them all, but they're really nice colours that I'll definitely wear a lot. I wondered how much lighter it was than say London or Mink so I compared and realised that I own 5 beige Nails Inc polishes now. That's really unnecessary, but at least I can have a go at some graduating colour ombre nails! Did you pick up any of these? Which is your favourite? The caramel looks lovely on you...very classic. Well done on getting all four! I'm going to get them all methinks...will I look insane buying 8 bottles of coke? i drink about that much diet coke a day.. The Heather Grey is much prettier on than I had imagined - damnit now I want it (& I don't even drink Diet Coke)! Thanks girls! I'm 2 bottles down, 6 still to drink! Oooh! I really like Heather Grey! Clearly I need to get into town and get me some Diet Coke pronto!